Let’s face it, as important as New Order’s legacy is, the band has been dialing it in for a while now. The fact that the group’s new album, Lost Sirens, is just eight songs, mostly leftover from 2005’s Waiting for the Sirens’ Call, certainly doesn’t help. 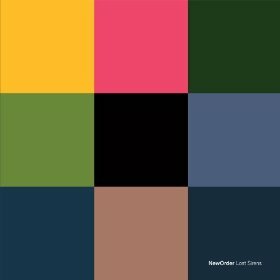 New Order has settled into that perfectly average middle-aged category that so many of their 80’s peers have found themselves in (looking at you, Echo & The Bunnymen), and the songs here provide very few surprises or much to latch onto, let alone stomp your feet to. “Californian Grass” and “I’ll Stay With You” exemplify standard mid-tempo, minor-key pop, and while “Sugarcane” has nice throbbing bass and a bouncy dance-friendly breakdown halfway through, the callous-rock-star-who-needs-to-turn-his-life-around lyrics are pretty corny, and the melody isn’t all that memorable, of course delivered with Bernard Sumner’s notoriously deadpan half-sung vocals. There are some winning highlights though; the previously-released “Hellbent” has a great groove, with spacious female backing vocals and Peter Hook’s signature lead bass lines. The remixed version of Waiting For the Sirens’ Call track “I Told You So” is good too, turning down the electronic pulse of the original for a more pysch-rock vamp that sounds very much in league with The Velvet Underground’s early stuff. But I can’t imagine Lost Sirens being of interest to many other than devoted New Order fans; the pop glory days are certainly long behind them and by the sounds of things, there isn’t really much left to look forward to. I would give it 3.5/ 5. It is a good album but it could have been better if they didn’t break up. Sugarcane, I’ll stay with you and Hellbent sound very good. I like Hellbent from the total version better than the original mix. If you like good uplifting music with great melodies and catchy songs then you will love this album, if you are a casual or a diehard New Order fan then you will like this album also. New order, what a Great band, what a Great life.